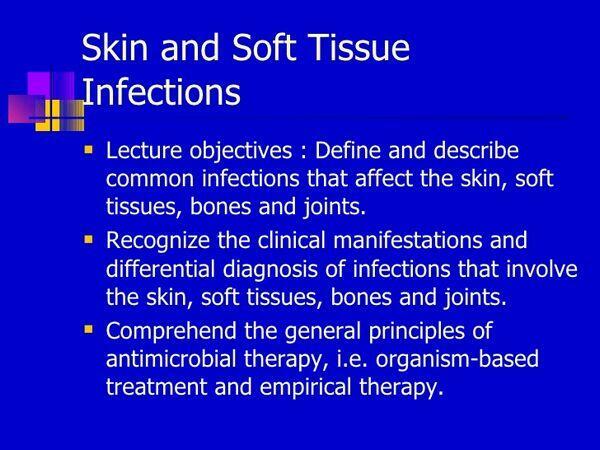 Bacterial infections of the skin can be classified as primary (pyodermas or cellulitis) or secondary (invasion of the wound) (Table Bacterial Classification of Important Skin and Soft Tissue Infections). Primary bacterial infections are usually caused by a single bacterial species and involve areas of generally healthy skin (e.g., impetigo, erysipelas). Secondary infections, however, develop in areas of previously damaged skin and are frequently polymicrobic in nature. The conditions that may predispose a patient to the development of skin and soft tissue infections include (1) a high concentration of bacteria, (2) excessive moisture of the skin, (3) inadequate blood supply, (4) availability of bacterial nutrients, and (5) damage to the corneal layer allowing for bacterial penetration. The majority of SSTISs are caused by gram-positive organisms and, less commonly, gram-negative bacteria present on the skin surface. Staphylococcus aureus and Streptococcus pyogenes account for the majority of skin and soft tissue infections. Cellulitis is an acute, spreading infectious process that initially affects the epidermis and dermis and may subsequently spread within the superficial fascia. This process is characterized by inflammation but with little or no necrosis or suppuration of soft tissue. Cellulitis is most often caused by S. pyogenes or by S. aureus (see Table Bacterial Classification of Important Skin and Soft Tissue Infections). Animal Pasteurella multocida, S. aureus, streptococci, Bacteroides spp. Cellulitis is characterized by erythema and edema of the skin. The lesion, which may be extensive, is painful and nonelevated and has poorly defined margins. Tender lymphadenopathy associated with lymphatic involvement is common. Malaise, fever, and chills are also commonly present. There is usually a history of an antecedent wound from minor trauma, an ulcer, or surgery. A Gram stain of a smear obtained by injection and aspiration of 0.5 mL of saline (using a small-gauge needle) into the advancing edge of the erythematous lesion may help in making the microbiologic diagnosis but often yields negative results. Acute cellulitis with mixed aerobic-anaerobic flora generally occurs in diabetes, where the skin is near a traumatic site or surgical incision, at sites of surgical incisions to the abdomen or perineum, or when host defenses are compromised. The goal of therapy of acute bacterial cellulitis is rapid eradication of the infection and prevention of further complications. Antimicrobial therapy of bacterial cellulitis is directed toward the type of bacteria either documented to be present or suspected. Local care of cellulitis includes elevation and immobilization of the involved area to decrease local swelling. As streptococcal cellulitis is indistinguishable clinically from staphylococcal cellulitis, administration of a semisynthetic penicillin (nafcillin or oxacillin) is recommended until a definitive diagnosis, by skin or blood cultures, can be made (Table Initial Treatment Regimens for Cellulitis Caused by Various Pathogens). If documented to be a mild cellulitis secondary to streptococci, oral penicillin VK, 250 to 500 mg four times daily for 7 to 10 days, or intramuscular procaine penicillin may be administered. More severe streptococcal infections should be treated with intravenous antibiotics (such as ceftriaxone 50 to 100 mg/kg as a single dose). Mild to moderate staphylococcal infections may be treated orally with dicloxacillin, 250 to 500 mg four times daily. In penicillin-allergic patients, oral or parenteral clindamycin may be used. Alternatively, a first-generation cephalosporin such as cefazolin (1 to 2 g intravenously every 6 to 8 hours) may be used cautiously for patients who have not experienced immediate or anaphylactic penicillin reactions and are penicillin skin test negative. In mild cases where an oral cephalosporin can be used, cefadroxil, 500 mg twice daily, or cephalexin, 250 to 500 mg four times daily, is recommended. Cefaclor, cefprozil, and cefpodoxime proxetil are effective but more expensive. Alternative agents for documented infections with resistant gram-positive bacteria such as methicillin-resistant staphylococci and vancomycin-resistant enterococci include linezolid, quinupristin/dalfopristin, and daptomycin. In severe cases in which cephalosporins cannot be used because of documented methicillin resistance or severe allergic reactions to β- lactam antibiotics, intravenous vancomycin should be administered. For cellulitis caused by gram-negative bacilli or a mixture of microorganisms, immediate antimicrobial chemotherapy as determined by Gram stain is essential, along with appropriate surgical excision of necrotic tissue and drainage. Gram-negative cellulites may be treated appropriately with an aminoglycoside or first- or second-generation cephalosporin. If gram-positive aerobic bacteria are also present, penicillin G or a semisynthetic penicillin should be added to the regimen. Therapy should be 10 to 14 days in duration. aFor penicillin-allergic patients, use clindamycin 150-300 mg orally every 6-8 h (pediatric dosing: 10-30 mg/kg/day in 3-4 divided doses). bFor methicillin-resistant staphylococci, use vancomycin 0.5-1 g every 6-12 h (pediatric dosing 40 mg/kg/day in divided doses) with dosage adjustments made for renal dysfunction. cFor type II necrotizing fasciitis, use clindamycin 0.6-0.9 g intravenous every 8 h (in children, clindamycin 15 mg/kg/day intravenous in 3 divided doses) should be added. dFor penicillin-allergic adults, use a fluoroquinolone (ciprofloxacin 0.5-0.75 g orally every 12 h or 0.4 g intravenous every 12 h; levofloxacin 0.5-0.75 g orally or intravenous every 24 h; gatifloxacin 0.4 g orally or intravenous every 24 h; or moxifloxacin 0.4 g orally or intravenous every 24 h). eGentamicin or tobramycin, 2 mg/kg loading dose, then maintenance dose determined by serum concentrations. fA fluoroquinolone or aztreonam 1 g intravenous every 6 h may be used in place of the aminoglycoside in patients with severe renal dysfunction or other relative contraindications to aminoglycoside use. Erysipelas (Saint Anthony's fire) is an infection of the superficial layers of the skin and cutaneous lymphatics. The infection is almost always caused by β- hemolytic streptococci, with S. pyogenes (group A streptococci) responsible for most infections. Erysipelas manifests as a bright red, edematous, indurated, and painful lesion sharply circumscribed by an elevated border. Leukocytosis is common. Patients often experience flulike symptoms (fever and malaise) prior to the appearance of the lesions. The lower extremities are the most common sites for erysipelas. Mild to moderate cases of erysipelas in adults are treated with procaine penicillin G, 600,000 units intramuscularly twice daily, or penicillin VK, 250 to 500 mg orally four times daily, for 7 to 10 days. Penicillin-allergic patients can be treated with clindamycin, 150 to 300 mg orally every 6 to 8 hours (10 to 30 mg/kg/day in three to four divided doses for children). For more serious infections, aqueous penicillin G, 2 to 8 million units daily, should be administered intravenously. Exposed skin, especially the face, is the most common site for impetigo. Pruritus is common, and scratching of the lesions may further spread infection through excoriation of the skin. Other systemic signs of infection are minimal. Weakness, fever, and diarrhea are sometimes seen with bullous impetigo. Nonbullous impetigo manifests initially as small, fluid-filled vesicles. These lesions rapidly develop into pus-filled blisters that readily rupture. Purulent discharge from the lesions dries to form golden yellow crusts that are characteristic of impetigo. In the bullous form of impetigo, the lesions begin as vesicles and turn into bullae containing clear yellow fluid. Bullae soon rupture, forming thin, light brown crusts. Regional lymph nodes may be enlarged. Penicillinase-resistant penicillins (such as dicloxacillin 12.5 mg/kg orally daily in for divided doses for children) are the agents of first choice because of the increased isolation of S. aureus. First-generation cephalosporins (such as cephalexin 25 to 50 mg/kg orally daily in two divided doses for children) are also effective. Penicillin may be used for impetigo caused by S. pyogenes. It may be administered as either a single intramuscular dose of benzathine penicillin G (300,000 to 600,000 units in children, 1.2 million units in adults) or as oral penicillin VK given for 7 to 10 days. The duration of therapy is 7 to 10 days. Mupirocin ointment is as also effective. Many factors are thought to predispose patients to the formation of pressure ulcers: paralysis, paresis, immobilization, malnutrition, anemia, infection, and advanced age. Four factors thought to be most critical to their formation are pressure, shearing forces, friction, and moisture; however, there is still debate as to the exact pathophysiology of pressure sore formation. The areas of highest pressure are generated over the bony prominences. Pressure sores are routinely colonized by a wide variety of microorganisms; gram-negative aerobes and anaerobes are most often associated with the infections. Most pressure sores are colonized by bacteria; however, bacteria frequently infect healthy tissue. A large variety of aerobic gram-positive and gram-negative bacteria, as well as anaerobes, are frequently isolated. More than 95% of all pressure sores are located on the lower part of the body. Pressure sores can be classified in stages (Table Pressure Sore Classification). Pressure sores vary greatly in their severity, ranging from an abrasion to large lesions that can penetrate into the deep fascia involving both bone and muscle. Without treatment, an initial small localized area of ulceration can rapidly progress to 5 to 6 cm within days. Prevention is the single most important aspect in the management of pressure sores. Friction and shearing forces can be minimized by proper positioning. Skin care and prevention of soilage are important, with the intent being to keep the surface relatively free from moisture. Relief of pressure (even for 5 minutes once every 2 hours) is probably the single most important factor in preventing pressure sore formation. Stage 1 Pressure sore is generally reversible, is limited to the epidermis, and resembles an abrasion. It is best described as an irregularly shaped area of soft tissue swelling with induration and heat. Stage 2 A stage 2 sore may also, be reversible; it extends through the dermis to the subcutaneous fat along with extensive undermining. Stage 3 In this instance, the sore or ulcer extends further into subcutaneous fat along with extensive undermining. Stage 4 The sore or ulcer is characterized by penetration into deep fascia involving both muscle and bone. Note: Stage 3 and 4 lesions are unlikely to resolve on their own and often require surgical intervention. Medical management is generally indicated for lesions that are of moderate size and of relatively shallow depth (stage 1 or 2 lesions) and are not located over a bony prominence. The main factors to be considered for successful topical therapy (local care) are the relief of pressure, debridement of necrotic tissue, wound cleansing, dressing selection, and prevention and treatment of infection. Debridement can be accomplished by surgical or mechanical means (wet-to-dry dressing changes). Other effective therapies are hydrotherapy, wound irrigation, and dextranomers. Pressure sores should be cleaned with normal saline. A number of agents have been used to disinfect pressure sores (e.g., acetic acid, sodium hypochlorite, hydrogen peroxide, mupirocin, bacitracin) as well as other types of open wounds; however, these agents should be avoided as they impair healing. A short, 2-week trial of topical antibiotic (silver sulfadiazine or triple antibiotic) is recommended for a clean ulcer that is not healing or is producing a moderate amount of exudate despite appropriate care. Patients at risk of acquiring an infection after a bite have had a puncture wound, have not sought medical attention within 12 hours of injury, and are older than 50 years of age. The infected dog bite is usually characterized by a localized cellulitis and pain at the site of injury. The cellulitis usually spreads proximally from the initial site of injury. If Pasteurella multocida is present, a rapidly progressing cellulitis with a gray malodorous discharge may be encountered. Most infections are polymicrobial, and the most frequently isolated organisms are Pasteurella spp., streptococci, staphylococci, Moraxella, and Neisseria. The most common anaerobes are Fusobacterium spp., Bacteroides spp., Porphyromonas, and Prevotella. Wounds should be thoroughly irrigated with a sterile saline solution. Proper irrigation will reduce the bacterial count in the wound. The role of antimicrobials for noninfected dog bite wounds remains controversial because only 20% of wounds become infected. Antibiotic recommendations for empiric treatment include a 3- to 5-day course of (1) a β- lactam antibiotic with β- lactamase inhibitor, (2) a second-generation cephalosprin with anaerobic activity, or (3) penicillin in combination with a first-generation cephalosporin or clindamycin. Tetracycline or trimethoprim-sulfamethoxazole is recommended as an alternative form of therapy for patients allergic to penicillins. Erythromycin may be considered an alternative for tetracycline in growing children or pregnant women. Prophylactic therapy should be given for 3 to 5 days. In addition to irrigation and antibiotics, when indicated, the injured area should be immobilized and elevated. Infections developing within the first 24 hours of a bite are most often caused by P. multocida and should be treated with penicillin VK or amoxicillin/clavulanic acid (tetracycline is an alternative for nonpregnant adult penicillin-allergic patients). Treatment should be given for 10 to 14 days. For infections developing more than 36 to 48 hours after the bite, the risk of P. multocida being involved dramatically decreases in likelihood. Therapy in this instance includes a penicillinase-resistant penicillin (e.g., dicloxacillin) or a cephalosporin (e.g., cefuroxime axetil) and should be given for a full 10 to 14 days. If the immunization history of a patient with anything other than a clean minor wound is not known, tetanus/diphtheria toxoids (Td) and tetanus immune globulin (TIg) should be administered. If a patient has been exposed to rabies, the treatment objectives consist of thorough irrigation of the wound, tetanus prophylaxis, antibiotic prophylaxis (if indicated), and immunization. Postexposure prophylaxis immunization consists of both passive antibody administration and vaccine administration. Approximately 30% to 50% of cat bites become infected. These infections are frequently caused by P. multocida, which has been isolated in the oropharynx of 50% to 70% of healthy cats. The management of cat bites is similar to that discussed for dog bites. Antibiotic therapy with penicillin is the mainstay, and therapy is as described for dog bites. Infections can occur in up to 50% of patients with human bites. Infections caused by these injuries are most often caused by the normal oral flora, which includes both aerobic and anaerobic microorganisms. The most frequent aerobic organisms are streptococcal species, S. aureus, Klebsiella pneumoniae, and Eikenella corrodens. The most common anaerobic organisms are Prevotella, Fusobacterium, Veillonella, and Peptostreptococcus species. Anaerobic microorganisms have been isolated in the range of 40% of human bites and 55% of clenched-fist injuries. Management of bite wounds consists of aggressive irrigation, surgical debridement, and immobilization of the affected area. Primary closure for human bites is not generally recommended. If damage to a bone or joint is suspected, radiographic evaluation should be undertaken. Tetanus toxoid and antitoxin may be indicated. If the biter is HIV positive, the victim should have a baseline HIV status determined and then repeated in 3 and 6 months. The bite should be thoroughly irrigated with a virucidal agent such as povidone-iodine. Victims may be offered antiretroviral chemoprophylaxis. Patients with noninfected bite injuries should be given prophylactic antibiotic therapy. Initial therapy should consist of a penicillinase-resistant penicillin (e.g., dicloxacillin) in combination with penicillin. Prophylactic therapy should be given for 3 to 5 days as for dog bites. A first-generation cephalos- porin or macrolide is not recommended, as the sensitivity to E. corrodens is variable. For infected bite wounds, penicillin and a penicillinase-resistant penicillin or amoxicillin/clavulanic acid should be empirically started and changed pending the culture results. Duration of therapy for infected bite injuries should be 7 to 14 days. Three key factors are involved in the causation of diabetic foot problems: neuropathy, ischemia, and immunologic defects. Any of these disorders can occur in isolation; however, they frequently occur together. There are three major types of diabetic foot infections: deep abscesses, cellulitis of the dorsum, and mal perforans ulcers of the sole of the foot. Osteomyelitis may occur in 30% to 40% of infections. Diabetic foot infections are typically polymicrobic (an average of 4.1 to 5.8 isolates per culture). Staphylococci (especially S. aureus)and streptococci are the most common pathogens, although gram-negative bacilli and anaerobes are common. Other common isolates include Escherichia coli, Klebsiella spp., Proteus spp., P. aeruginosa, B. fragilis, and Peptostreptococcus spp. The goal of therapy is preservation of as much normal limb function as possible while preventing infectious complications. Most infections can be successfully treated on an outpatient basis with wound care and antibiotics. Diabetic control should be maximized to ensure optimal healing. The patient should initially be restricted to bedrest, leg elevation, and control of edema, if present. After healing of the infected ulcer has occurred, a program for prevention should be designed. Amoxicillin/clavulanate is the agent of choice for oral outpatient treatment; however, this agent does not cover P. aeruginosa. Fluoroquinolones with metronidazole or clindamycin are reasonable alternatives. Serious polymicrobic infections may be treated with agents used for anaerobic cellulitis. Monotherapy with broad-spectrum parenteral antimicrobials, along with appropriate medical and/or surgical management, is often effective in treating moderate to severe infections (including those in which osteomyelitis is present). Vancomycin is used frequently in severe infections with gram-positive pathogens. With increasing staphylococcal resistance, linezolid, quinupristin/dalfopristin, and daptomycin are alternatives. Treatment of soft tissue infections in diabetic patients should generally be at least 10 to 14 days in duration, and up to 21 days in severe infections. However, in cases of underlying osteomyelitis, treatment should continue for 6 to 12 weeks.